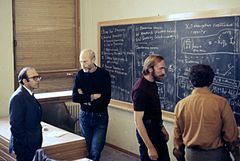 Discussion in the main lecture hall at the École de Physique des Houches (Les Houches Physics School), 1972. From left, Yuval Ne'eman, Bryce DeWitt, Kip Thorne. Bryce Seligman DeWitt (January 8, 1923 – September 23, 2004) was an American theoretical physicist who studied gravity and field theories. He was born Carl Bryce Seligman but he and his three brothers added "DeWitt" from their mother's side of the family, at the urging of their father in 1950, after Bryce experienced anti-semitism as a "budding young scientist in Europe" (Seligman is a Jewish name; ethnically Bryce is part Jewish). This is similar to Spanish naming customs, where a person bears two surnames, one being from their father and the other from their mother. Twenty years later this change of name is rumored to have so angered Felix Bloch that he blocked DeWitt's appointment to Stanford University and DeWitt instead moved to Austin, Texas. He served in World War II as a naval aviator. He was married to mathematical physicist Cécile DeWitt-Morette. He died September 23, 2004 from pancreatic cancer at the age of 81. He is buried in France, and was survived by his four daughters. He approached the quantization of general relativity, in particular, developed canonical quantum gravity and manifestly covariant methods that use the heat kernel. B. DeWitt formulated the Wheeler–DeWitt equation for the wavefunction of the Universe with John Archibald Wheeler and advanced the formulation of Hugh Everett's many-worlds interpretation of quantum mechanics. With his student Larry Smarr he originated the field of numerical relativity. He received his bachelor's in 1943, master's in 1947 and doctoral degrees from Harvard University in 1950. His Ph.D. supervisor was Julian S. Schwinger. Afterwards he worked at the Institute for Advanced Study, the University of North Carolina at Chapel Hill and the University of Texas at Austin. From 1953 to 1956 DeWitt was at the Lawrence Livermore National Laboratory. He was awarded the Dirac Prize in 1987, the American Physical Society's Einstein Prize in 2005 (posthumously), and was a member of the National Academy of Sciences and the American Academy of Arts and Letters. Bryce DeWitt, R. Neill Graham, eds., The Many-Worlds Interpretation of Quantum Mechanics, Princeton Series in Physics, Princeton University Press (1973), ISBN 0-691-08131-X. S. M. Christensen, ed., Quantum theory of gravity. Essays in honor of the 60th birthday of Bryce S. DeWitt, Adam Hilger, Bristol, 1984. Bryce DeWitt, Supermanifolds, Cambridge University Press, Cambridge, 1985. Bryce DeWitt, The Global Approach to Quantum Field Theory, The International Series of Monographs on Physics, Oxford University Press, 2003, ISBN 978-0-19-851093-2. Bryce DeWitt, Sopra un raggio di luce, Di Renzo Editore, Roma, 2005. ^ DeWitt Smith, Vona (2004). Tierck Clafsen DeWitt and Descendants of His Son Luycas DeWitt. Bloomington, Indiana: Trafford Publishing. p. 198. ^ "Pioneering physicist Bryce DeWitt dies". University of Texas News. Austin, Texas: The University of Texas at Austin. October 20, 2004. Retrieved March 13, 2018. ^ Rickles, Dean (2010). The Chapel Hill Conference in Context. The Role of Gravitation in Physics. Berlin: Max-Planck-Gesellschaft. This page was last edited on 6 April 2019, at 07:38 (UTC).